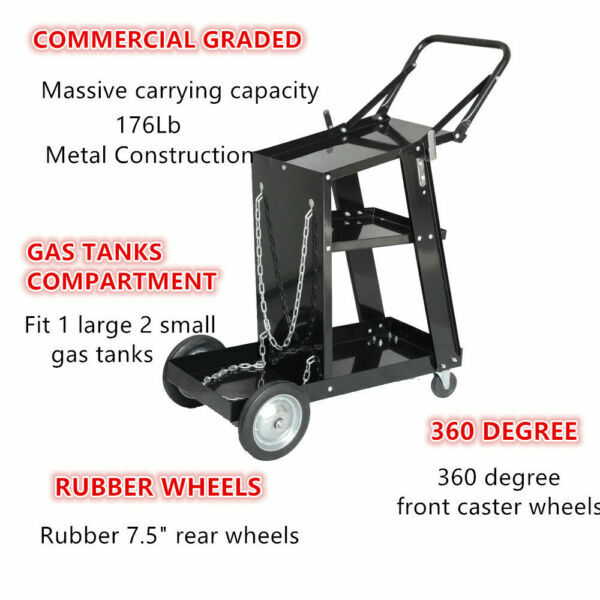 HEAVY DUTY: Sturdy welding cart is constructed of premium metal and PVC wheels, built in a solid structure with high load capacity up to 176 lb / 80 kg; fully painted cart can withstand rust and wear, a strong and durable welding cart for your long-term use. 3-TIER STORAGE: This 3 tiers welder cart provides ample storage space for you to organize tools and equipments, tilted top shelf for easy tool access and safe welder storage; a rear shelf special for tank storage, help you built a neat and ordered garage or workshop. SMOOTH ROLLING: This welder cart features with 4 heavy duty PVC casters, 2 front 360°swivel casters control the cart to move in all directions, 2 big rear wheels provide optimal stability. CONVENIENT DESIGN: Features a pulling handle on the top for easy moving and fetching; 2 hooks on both sides to store the cables or hang gloves, make your tools handy and well-organized; comes 2 sturdy chains to secure the tank in place. This three-tier welding cart puts the welder controls at a comfortable working height and has storage shelves for all your tools, parts and accessories. The slanted top shelf accommodates most brands of welding equipment and places the welder controls at an easy to use angle. Heavy duty with a total load capacity of up to 176 Lb so you can use it for a quick welding job or a big project. Made from super strong metal that is perfect for a workshop or garage. After receiving your order, we will send out your package within 24 hours. We also use the 24-hour delivery service to make sure you can receive your delivery in 48 hours after you placing an order. This will be the fastest delivery service you can get in the US! Because eBay charges the lowest fee among the online shopping platforms, the same product has a lower and more competitive price on eBay, which means you can get the exactly same product as sold on other platforms in a much lower price on eBay. Save your money! The quality of products is our bottom line. We will keep offering you high quality products. We also provide an excellent after-sales service for you to have a worry-free online shopping experience. Payment should be completed immediately upon purchase. We appreciate a positive feedback as much as you do. If for some reason there is any issue with the purchase, please contact us prior to leaving feedback, and we will be glad to work with you to have it resolved. Shipping by USPS or UPS, Package handling takes 1 business day at our warehouse and delivered within 3 days, so please make sure enter correct payment and shipping information before checking out. Once your payment is completed, inform us by message if the changes are needed before we ship the product. Orders placed on weekend will be shipped within 2 business days. USPS: 2-9 business days. | UPS: 1-6 business days. Please note that all returns must be pre-approved by Topeakmart. Unauthorized returns will not be accepted. If you need to return, please check twice to confirm the item not work and contact our customer service representative, let us know the detailed problem and send us some pictures for confirmation. All NON-seller mistake returns for refund are subject to 20% re-stocking fee and buyer should pay for the round-trip shipping fee. (E.g. you bought wrong model or wrong color). No local pickup and NO local return to return address! 1. If you are satisfied with the product you received, please leave us positive feedback and 5 star comment, which will be highly appreciated. 2. If there is any problem about your order, please contact seller prior to leaving feedback, and we will be glad to work with you to have it resolved. 3.If you are dissatisfied for any reason, please do not be quick to leave negative or neutral feedback. We’ll try our best to resolve any problem for you to make EACH CUSTOMER 100% SATISFIED and always leave positive feedback to all our customers. we will answer within 24 hours(except Holiday).